One of the things about sending out information to members about what is happening within the Tot Club is that we get back information from members. Sometimes it’s just a few lines, sometimes it’s personal but, sometimes it’s a piece we can put up on the website. Please keep these pieces coming. Submissions by Members will be included at the discretion of the Management and may be edited or modified to suit the occasion or website. To submit an item please click here (opens in your email system). Changing your contact information, or a new member and not receiving email updates? Please click here and enter all your (new) details plus your name and membership number. 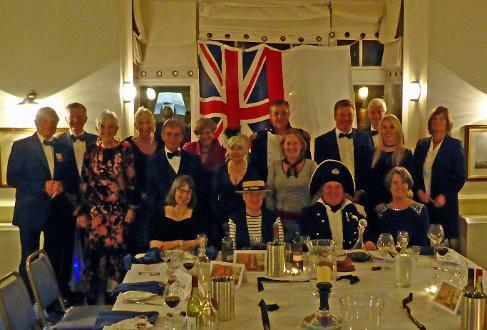 Pickle Night, Friday 2nd November, held in Royal Dart Yacht Club, Kingswear, Dartmouth. Nine Tot Club Members and 8 Guests. Four in Georgian Period Naval Costume. Quality of photo not great but gives ‘a feel’ for the evening and those present. 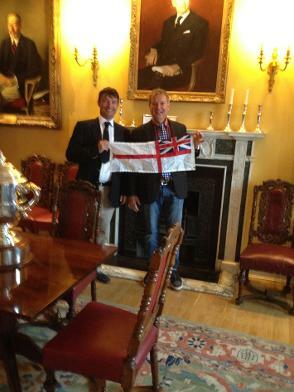 Rob MacLean and Sussex Yacht Club member, Tim Cork, displaying the Tot Club Burgee in the members Dining Room at the Royal Yacht Squadron. Apologies to Tim, the first of these was submitted on 1st June but, due to a communication breakdown, it was not filed. Once the mis-understanding was resolved the item was overlooked until the second submission arrived. 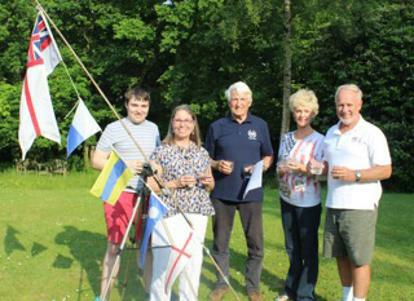 Daniel, Kathy, and Mike Beggs, and Caroline and Tim deGavre celebrate the 100th anniversary of the Battle of Jutland with a Tot on 31 May. 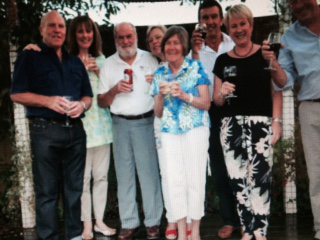 The following evening, same venue, same motley assemblage, we had a Tot to celebrate The Glorious First of June. Ah, the flags. Below the RNTCAB pennant are four flags that spell out BREXIT. No, wait, I have that wrong. As any signalman worth his ration of rum would know, it signals “Splice the Mainbrace”. 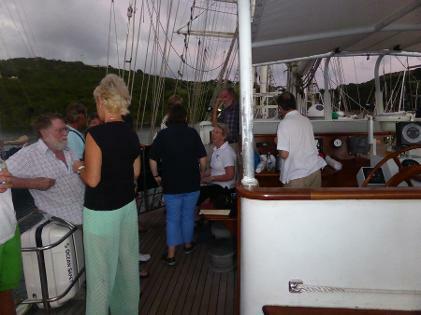 The Tots were followed with the like-minded celebrants enjoying the usual Tot fare: a fine dark rum, Kraken, and one of the best rums that Antigua can produce at the distillery down by Rat Island, Cavalier, along with a huge wedge of Stilton cheese (eat your heart out Mike Rose!). 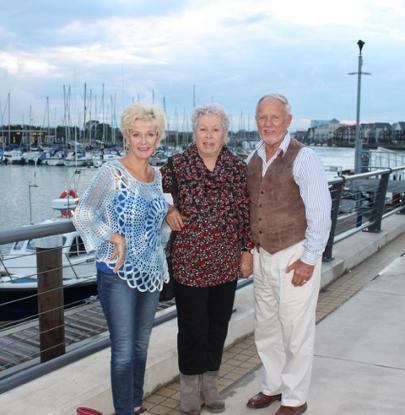 Caroline and I met up with Stephanie in Rustington where we had a laugh-filled meal at the Mussel Row along the waterfront. She hasn’t changed a lick. Same ol’ delightful Steph. She leaves England on Tuesday (21st June), flying back to Lone Pine. I thought members might appreciate a belated account of an early Tot in celebration of The Battle of Copenhagen. It occurred at about 2300 on the 1 April as HMSTC Adventure was rounding Cape Horn. Despite my best endeavours to slow the vessel down, I couldn’t delay until our “White Ensign Day”! ( if we worked on GMT though they would!!) 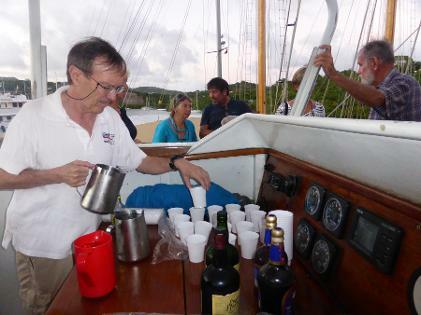 HMSTC Adventure is one of two Service yachts currently completing a yearlong circumnavigation. The crew of Adventure is predominantly drawn from the Royal Navy and Royal Air Force, the other yacht HMSTC Discoverer is crewed by the Army. I was one of two soldiers drafted to Adventure and sailed as a watch leader. Both yachts, now owned by the MOD, are Challenge72s and so are in their home environment. We rounded in a F8 gale and shortly before had had something of a “mare” sorting fouled sheets. 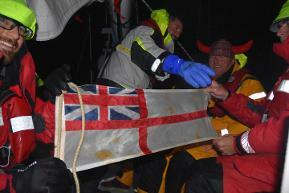 Wind and sea conditions precluded hoisting the Tot Club Burgee for the occasion. 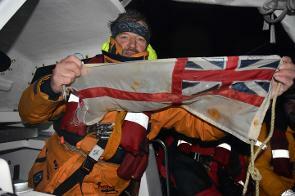 We gathered in the cockpit with a bottle of the obvious which was shared to mark the occasion and despite the weather and our fatigue it was a seminal moment not just marking our own “rounding” but also a moment to reflect on the generations of seafarers who had preceded us. That reflection was made more poignant by the recently received news that Sarah Young from the yacht Ichorcoal, part of the Clipper fleet, had been lost overboard earlier that day in the North Pacific. The 7312 NM passage from Port Fitzroy (a day sail from Auckland) to Punta Del Este took 37 days with wind strengths from F1 to F10 and wave heights of up to 40 feet and sail plans ranging from full main and spinnaker to storm jib and trysail. 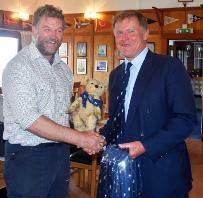 The crews flew back to UK to be greeted at Haslar in Gosport by Tot Club Member Andy Bristow, who is chairman of the International Association of Cape Horners, having rounded in 1990 aboard British Defender as part of the last British Services boat to compete in the RNSA initiated Whitbread Race, now known as the Volvo Ocean Race. It was reunions all round, “Teddy Brown”, who has been known to take the odd Tot, has clocked up several thousand sea miles, including sailing to Antarctica and qualifying as a Shellback with Andy who welcomed him as a fellow “Cape Horner”. Very sorry to here about the passing of Roger; please forward my condolences to those closest to him. 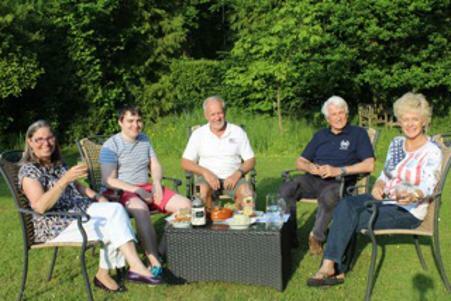 Joined Mike, the perfect man for the “proper job” doing the Tot, and Anne at the perfect hostess Sally’s beautiful country cottage for a wonderful night of tasty nibbles followed by a great dinner, straight after a two day jaunt of the Normandy Beaches Caen France. We had Two tots on Lord Nelson whilst she was in English Harbour. She had just left the Bahamas on her way back to UK.